India’s workhorse Polar Satellite Launch Vehicle (PSLV) has successfully launched on Monday, Sept. 26, with eight satellites, delivering them into two different orbits. The rocket lifted off at exactly 9:12 a.m. local time (03:42 GMT; 11:42 p.m. EDT on Sept. 25) from the First Launch Pad at Satish Dhawan Space Centre (SDSC) in Sriharikota. The mission, designated PSLV-C35 in the Indian Space Research Organisation’s (ISRO) numbering system, marks the first time when the PSLV sends its payload into two different orbits. The primary passenger of the flight – the ScatSat-1 satellite – was placed into a polar Sun-synchronous orbit (SSO) at an altitude of 447 miles (720 kilometers), inclined 98.1 degrees. The other seven satellites were also released into polar SSOs but at an altitude of 416 miles (670 kilometers). PSLV-C35 is the longest mission of the PSLV booster. The flight lasted for two hours and 15 minutes; whereas usually, the rocket needs about 20 minutes to place its payload into orbit. The necessity of putting the payload into various orbits had extended the mission by nearly two hours. The launch of the mission was initially scheduled for August 2016; however, ISRO decided to postpone it, not revealing the cause of this delay. On Sept. 23, the Mission Readiness Review (MRR) committee and Launch Authorisation Board (LAB) have cleared PSLV-C35 for the 48-hour countdown that was commenced at 8:42 a.m. local time on Sept. 24 (3:12 GMT; 11:12 p.m. EDT on Sept. 23). During the countdown campaign, the teams conducted final pre-launch activities to ready the launch vehicle for its imminent liftoff. The rocket was filled with propellant and last checks of the systems were carried out. The Mobile Service Tower (MST) was withdrawn, leaving the launch vehicle ready for ignition. The PSLV-C35 mission rocket ascended from the launch pad after igniting its core stage and four out of six strap-on boosters. The other two boosters were ignited 25 seconds after liftoff, at an altitude of about 1.5 miles (2.4 kilometers), as the rocket continued its vertical climb. Then the launch vehicle started turning southeasterly to avoid flying over the island of Sri Lanka in order to not drop the boosters on populated areas. Afterward, the rocket turned south, heading toward over the center of the Indian Ocean. The quartet of ground-lit strap-on boosters, which were ignited first, was jettisoned at one minute and eight seconds after launch. Twenty-two seconds later, the two air-lit boosters were also separated, leaving the launch vehicle being powered by its core stage alone. The first stage continued the flight for another 22 seconds until it detached from the vehicle. Almost immediately, the second stage of the rocket was ignited, taking control over the mission for the next two-and-a-half minutes. During this phase of the flight, the protective payload fairing was separated from the rocket at two minutes and 41 seconds into the flight, unveiling the mission’s passengers at an altitude of 71.5 miles (115 kilometers). The second stage was detached from the launch vehicle at T+4 minutes and 24 seconds. The third stage was powered-on one second later and continued to lift the payload from 138 miles (223 kilometers) above the ground to an altitude of about 360 miles (580 kilometers). Then the third stage separated at nine minutes and 48 seconds into the flight. The stack, consisting of the rocket’s fourth stage (known as PS4) and the mission payload, entered a ‘free-floating’ phase lasting for two minutes and 40 seconds. Next, the fourth stage was ignited, firing its engine for about three-and-a-half minutes until it was shut down. Shortly after, at T+17 minutes and 33 seconds, the car-sized ScatSat-1 satellite was released into space. ISRO’s ScatSat-1 (Scatterometer Satellite-1) weather satellite, which weighs in at approximately 818 pounds (371 kg), is based on the IMS-2 bus. The spacecraft features two deployable solar arrays capable of generating about 750 W of power and is equipped with a Ku-band scatterometer with a mass of around 242 pounds (110 kg). The designed operational lifetime of the satellite is five years. ScatSat-1 is a weather and ocean tracker, designed to provide wind vector data for weather forecasting, cyclone detection, and tracking services to its users. The satellite is the continuation of the OceanSat-2 mission launched by India in September 2009, to study surface winds and ocean surface strata. After the separation of ScatSat-1, the PS4 stage, in order to deliver other seven satellites into lower orbits, had to be shut down and restarted twice during the flight. The first restart was conducted about one hour later, at one hour and 22 minutes after launch, to complete a 20-second engine burn. The next restart was performed nearly 50 minutes later, commencing another 20-second burn. “Restarting a rocket engine soon after it is shut off is a critical technology that has to be mastered. Once a rocket engine is activated, then the heat generated is very high. The trick is to cool it down in space and to restart it [after] a short gap,” an industry expert told IANS. PS4’s cut-off after the second restart signaled the beginning of releasing the group of seven satellites into orbit. The spacecraft separated from the fourth stage in the time span of two minutes and 20 seconds, starting at T+2 minutes and 13 seconds. AlSat-1N, also known as AlSat-Nano, was released as the second satellite. It is a three-unit CubeSat built by Surrey Space Centre. With a mass of 15.4 pounds (7 kilograms), the nanosatellite will be used to demonstrate new and innovative space technologies. It will be operated jointly by Algerian Space Agency (ASAL) and the UK Space Agency. The PSLV-C35 mission also includes two other passengers from Algeria: AlSat-1B and AlSat-2B. They will be operated by ASAL. AlSat-1B, built by Surrey Satellite Technology Ltd. (SSTL), is a medium-resolution Earth-observing satellite, based on the SSTL-100 platform. It weighs about 227 pounds (103 kilograms) and will be used for reviewing agriculture production, the environment, as well as the monitoring of disasters. Manufactured by Airbus Defence and Space, AlSat-2B is a high-resolution remote sensing satellite with panchromatic and multispectral imaging capability. The 258-pound (117-kilogram) spacecraft will allow Algeria to acquire very high-quality images that could be used in a variety of applications: cartography, management of agriculture, forestry services, the management of natural disasters, and land planning. 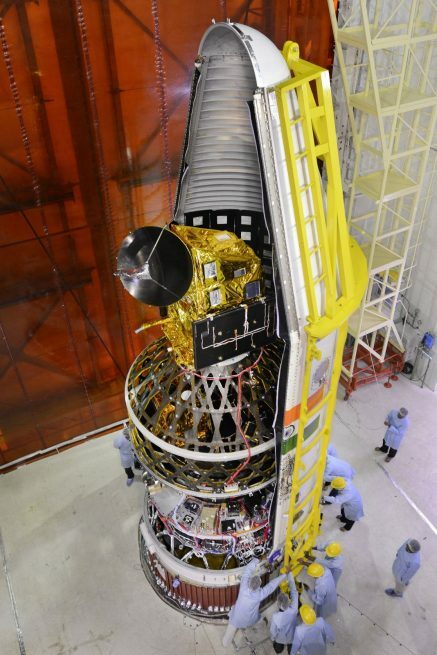 Besides ScatSat-1, the PSLV-C35 mission features two other Indian satellites: Pratham and PISat. Both are box-shaped nanosatellites developed by students. Built by the Indian Institute of Technology Bombay, Pratham is a technology demonstrator weighing around 22 pounds (10 kilograms). It will be used to estimate the Total Electron Count (TEC) with a resolution of 0.62 by 0.62 miles (1 km × 1 km) location grid. “The satellite will measure and map the total electron count in the ionosphere, which will help for predicting tsunamis. It will also enhance the accuracy of GPS in India,” said Ratnesh Mishra, a final-year student at the Indian Institute of Technology Bombay, who worked on the satellite for three-and-a-half years. Manufactured by the People’s Education Society Institute of Technology (PESIT) in Bengaluru, the PESIT Imaging Satellite, or PISat, is designed for remote sensing applications. With a mass of approximately 11.6 pounds (5.25 kilograms), this nanosat will utilize its color camera, named NanoCam, to obtain imagery of Earth’s surface with a resolution of approximately 262 feet (80 meters). One commercial payload was also launched by PSLV-C35 – the Pathfinder-1 high-resolution imaging microsatellite. Developed by Spaceflight Services, the satellite will be operated by a U.S. company BlackSky for up to three years. Pathfinder-1 weighs some 97 pounds (44 kilograms) and is the first of two demo satellites (Pathfinder-2 is scheduled to be sent into space in November 2016) for the company’s network of Global spacecraft, slated to be launched in 2017. “We work with a variety of reliable launch providers around the globe and India’s PSLV is one of them,” Rakesh Narasimhan, executive vice president and general manager of BlackSky, told SpaceFlight Insider. Monday’s mission also launched a Canadian three-unit CubeSat nanosatellite, named CanX-7 (Canadian Advanced Nanospace eXperiments 7), also known as NLS-19. It was built by the University of Toronto and weighs approximately 17.6 pounds (8 kilograms). The tiny spacecraft is a technology demonstrator that will deploy a drag sail to perform experiments to help reduce space debris and for tracking commercial aircraft. The four-stage PSLV is India’s most reliable launch vehicle. The rocket has been used to deliver more than 40 satellites to orbit for some 19 countries to date. The C35 mission PSLV-G is capable of lofting up to 3.2 metric tons to a low-Earth orbit and about 1.1 metric tons to a geosynchronous transfer orbit (GTO). The rocket uses an Earth-storable, liquid-fueled rocket engine for its second stage, known as the Vikas engine; it was developed by the Liquid Propulsion Systems Centre. The third stage of the PSLV is powered by a solid rocket motor that provides the upper stage’s high-thrust requirements after the atmospheric phase of the mission. The rocket’s fourth stage is composed of two Earth-storable liquid-fueled engines. The 144-foot (44-meter) tall “G” version of the PSLV, which was used for Monday’s mission, is the standard configuration rocket with a mass of 295 metric tons at liftoff. It was fitted (for the first time since 2011) with six of the smaller S9 strap-on solid rocket motors. Monday’s mission was India’s sixth launch this year and the 37th flight of the PSLV booster overall. The country’s next flight is currently scheduled to take place in December when a GSLV rocket is scheduled to send ISRO’s GSAT-19E communications satellite into orbit. However, the exact date of that launch has yet to be announced. The rocket was clearly a PSLV G version with standard boosters however.